"We love the hell outta you." While Jussie Smollett is facing allegations of staging his crime last month, many have defaulted to either the actor or singer or simply keeping their distance. Recently, it was revealed that producers of Smollett's Empire series would be cutting out his character, Jamal Lyon, for the final two episodes of season 5 with other rumors suggesting that Smollett will be recast altogether for season 6. Notably, however, Smollett's co-star and Empire star Terrence Howard and his coworker and took to Instagram to upload a clip of Smollett onboard a private jet with Howard while holding Howard's baby boy, tickling the child and laughing with him in a warm moment. Attached to the clip is a caption that reads, "All your lilies got you … We love the hell outta you." In the show, Howard takes on the role of Smollett's TV father, Lucious Lyon, the fictional patriarch or music's most influential family. 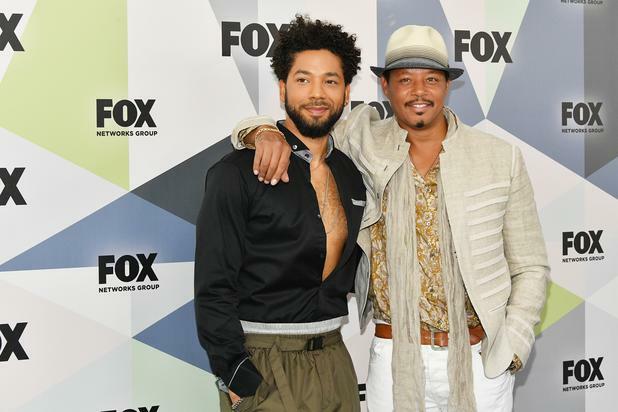 While Jamal and Lucious have a particularly delicate relationship onscreen, it's clear that Howard and Smollett's camaraderie runs deep enough for Howard to support the 36-year-old despite such glaring accusations. 00,000 bond after being charged with felony disorderly conduct for allegedly filing a false report. He has since been ordered to surrender his passport.